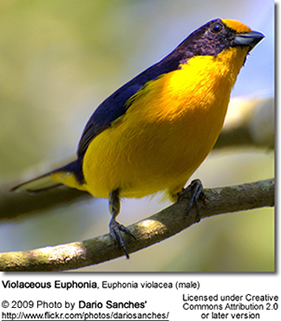 The Violaceous Euphonias (Euphonia violacea) are small finches found on the southern Caribbean islands of Trinidad and Tobago; as well as in South America, where they occur in eastern Venezuela south to Paraguay and northeastern Argentina. 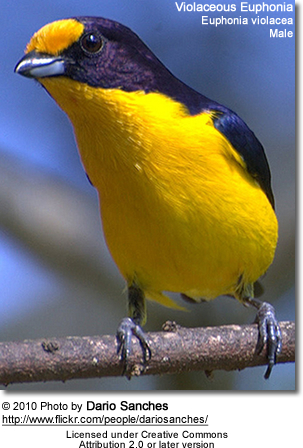 They are resident (non-migratory), inhabiting forests and citrus fruit and cocoa plantations. Violaceous Euphonias measure about 4.5 inches (11.4 cm) in length and weigh about 0.5 oz (14 g). 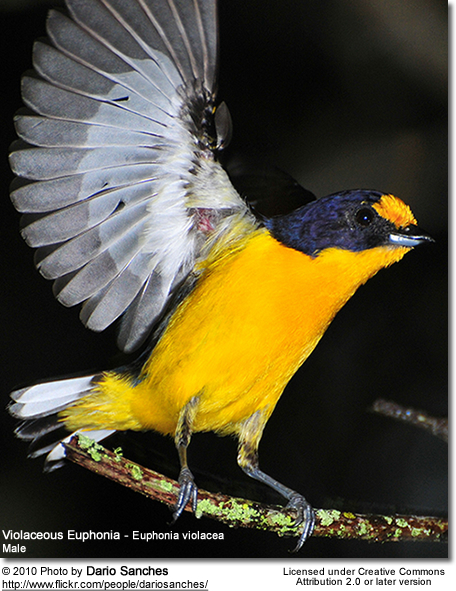 The male's upper plumage isglossy blue-black and his forehead and his plumage below is a deep golden yellow. 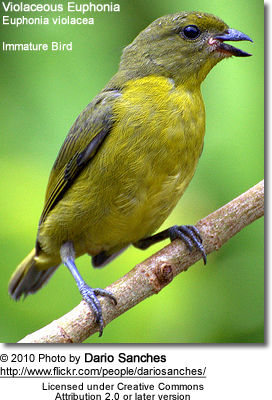 The female's plumage is olive green above and greenish yellow below. 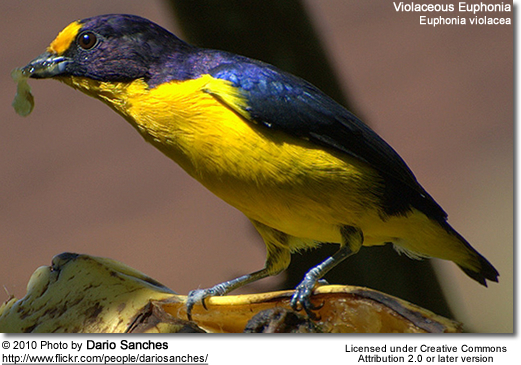 Their nests are in the shape of balls that are typically situated on bank, tree stumps or tree cavities. The average clutch consists of 3 - 4 red-blotched white eggs. 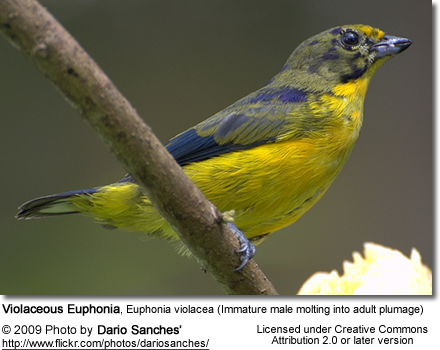 The female alone incubates (broods) the eggs to hatching. 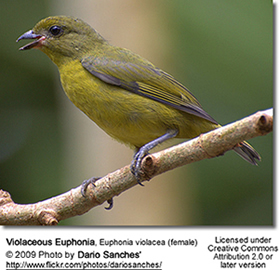 These social finches eat mainly small fruit and only rarely take insects. 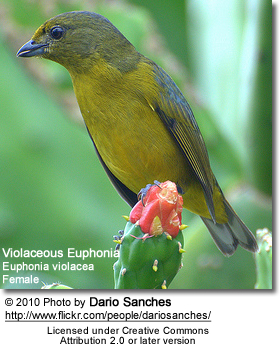 In particular, they are known to feed on mistletoe berries. Their gut is specially adapted for mistletoe berries, which are poisonous. 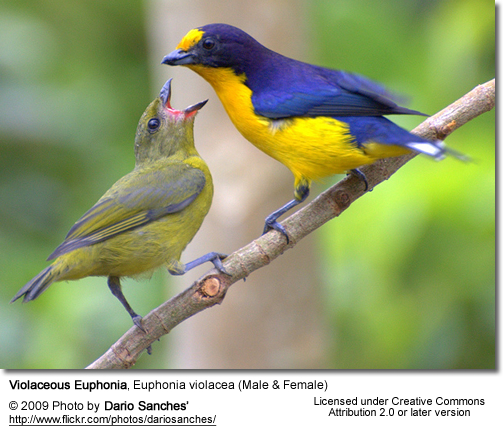 The Violaceous Euphonia’s song is a varied mix of musical notes, squeaks, chattering and imitation. 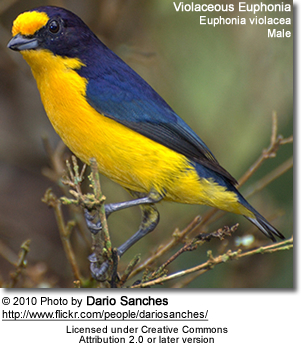 Members of the genus Euphonia are prized as cage birds and several are threatened by trapping, but this species benefits from its relatively inaccessible habitat.